The Methodist Hospital Research Institute is a cornerstone of The Methodist Hospital’s strategic vision for its future as a top-ranked academic medical center. The Methodist Hospital Research Institute will conduct groundbreaking translational and clinical research to provide the best possible care for their patients. Their goal is to make the latest laboratory findings available to patients in the form of new treatments and clinical trials as rapidly as possible. The Institute is committed to move the latest discoveries in the laboratory to the bedside in order to provide a new standard of care for their patients and those in other parts of the country. The Institute will serve as a focal point for physicians and scientists with diverse interests and backgrounds to come together and share ideas. Better treatment strategies for the patients will come from this varied mix of talent and skills. The excellence in research is a key ingredient in providing excellent patient care. The proposed facility will provide state-of-the-art research spaces for the highest caliber students, researchers, scientists and educators and, in turn, enhance the quality of care for community residents. Laboratories in the new facility will allow current trends in medical research to supplement traditional methods of research. Today’s teaching methods focus more on flexible, small group learning spaces that are wired for current technology requirements. The new building will facilitate the use of high-tech “dry” labs where technology simulates the wet lab experience, and enable small group instruction in “breakout rooms” to support lectures. The profession of Medicine is going through a radical change and because of this there is a shifting paradigm for Medical education as well. 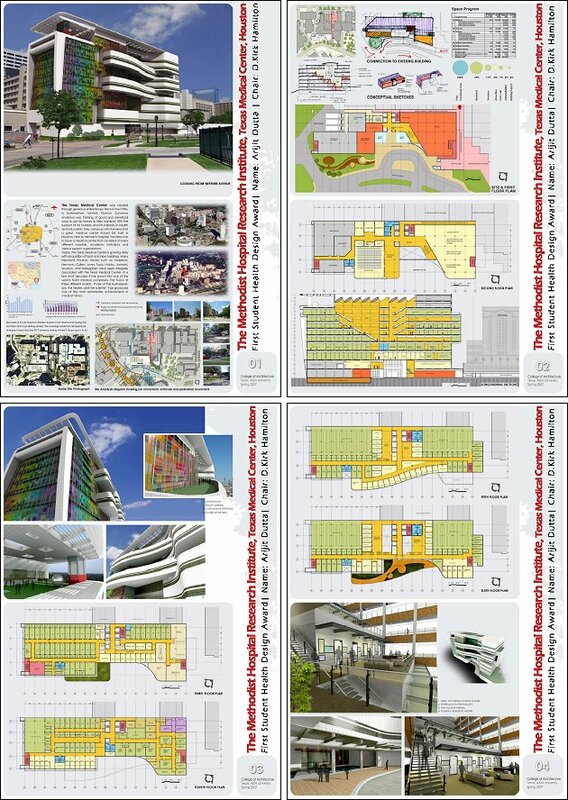 I have been working in consultation with the firm WHR Architects, Houston, who are the official architects for this project. It is a fast track project and is due for completion on Jan 2008. The program would be more or less similar to the one that is being used for the actual building. Activities are added to the program after the initial building type research is done. This would essentially be the direct outcome of implementing evidence based design that might require some additional spaces. 2. Site Analysis: It’s a real project on a dense urban site. Issues regarding the connection of the proposed building to the existing hospital building were to be addressed. Managing vehicular and pedestrian traffic was a challenge. The proposed building would be the new brand image of the Methodist Hospital which is competing against other institutions in the Texas Medical Center. 3. Proposal: My proposal for the project has been developed in three months time and it is a result of the concentrated effort put by me and my chair, Prof. D. Kirk Hamilton and committee members Prof. George Mann and Dr. Chanam Lee. The details of the proposal are attached.